Recipe Source Online: How To Green Your Summer Barbecue! How To Green Your Summer Barbecue! If you haven't already fired up your grill this summer, chances are you will once July 4th rolls around. 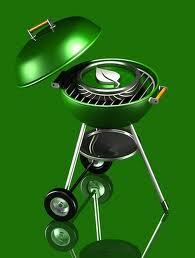 60 million Americans get their grills going on summer holiday weekends! Clearly, barbecues are an awesome way to get everyone together to enjoy each other's company and the weather. But have you ever thought of how to make your weekend barbecue a little greener? Here are some tips that maybe you haven't thought of. Read on for a "how to" on making a green barbecue. Grill with a gas or electric grill. If you already have a charcoal-burning grill, consider investing in a gas or electric grill when you're old one isn't doing the job anymore. Although charcoal grills deliver that mouth-watering smoky flavor we all love, it emits carbon monoxide and soot as it burns. If you do have a charcoal-burning grill, be sure to look for eco-friendly charcoal. Lump charcoal is made from hardwood and produces less ash than briquettes. Fortunately, there is some lump charcoal that is FSC-Certified! Use eco-friendly dinnerware and utensils. Although it is the easiest thing to do to just whip out the paper plates and plastic cups, look into getting some biodegradable dinnerware. They are starting to be just as common as common paper and plastic dinnerware (and they usually look nicer, too!) The United States tosses about 25 billion polystyrene cups per year! Also, if it's not a huge barbecue, use the dishware that you already have at home. Use biodegradable garbage bags. People tend to shy away from these since they assume they are more expensive. But they really don't cost much more than regular plastic bags! It's worth spending a few more cents on your garbage bags than contributing to the plastic in the landfills. Have a designated recycling bin or bag. Make sure everyone knows where the recycling bag is! Use cloth tablecloths & napkins. So much better than all of that paper! It's much more eco-friendly to use cloth products; after the barbecue you can throw them in the laundry and they're ready for your next big BBQ! Serve green food. Barbecues tend to be very meat focused. Burgers, hot dogs, chicken...but why not switch it up a little bit? Throw some local vegetables on the grill along with some veggie burgers or veggie hotdogs. Some people aren't too keen on that sort of "meat," so just make sure your "real" meat is green. Wegman's does a great job at giving its shoppers a lot of options. You can get organic, free-range, or grass-fed meat; you could even go to your farmer's market to make sure it's local! For dessert, support a local bakery or serve fresh local fruits. Serve green drinks. Have pitchers of tap water instead of individual water bottles. If soda is necessary, get the big 2 liter bottles instead of individuals cans. For alcoholic drinks, we're lucky that we live so close to the Finger Lakes that we have awesome local wine and a handful of great breweries! It's the greener choice to get your alcohol locally so it doesn't travel as far, just like your food. For beer, make sure you get growlers (1/2 gallon of beer) so you don't need to recycle individual cans. Rohrbach Brewing Company in Rochester has growlers at many local establishments. Best of all, you can return the empty growlers to the brewery and they'll take care of them for you! Hopefully you'll end up trying some of these new tips! Your friends will all catch on and make their barbecues greener, too. Get grillin'! Founded in 2000, Sunnking Inc. is New York States first EPA R2 Certified Electronics Recycling, Data Destruction, & Asset Management company dealing in end of life electronic equipment. Their facilities located in Buffalo, Rochester, and Brockport, NY, specialize in collecting, refurbishing, reselling, and recycling electronic products from residential and commercial suppliers throughout New York State and surrounding areas. For more information please visit our website at http://www.sunnking.com/ or contact us at 1-877-860-7866.